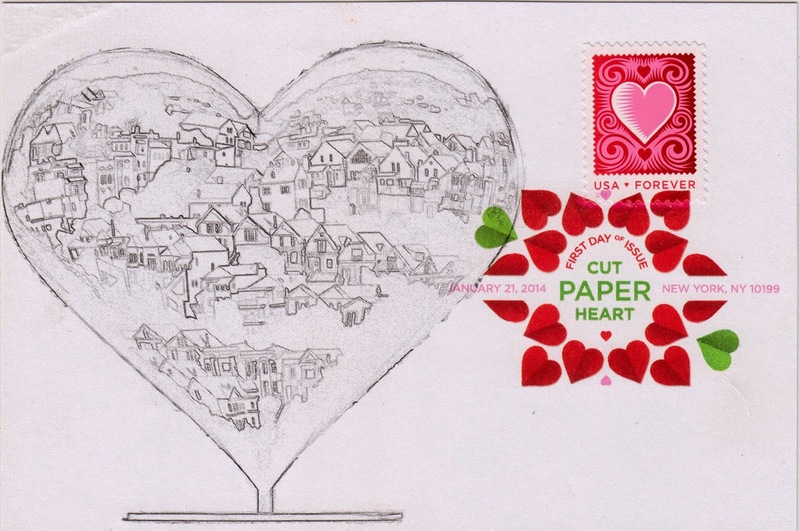 Postcard US-2813946 to the Netherlands features a sketch of a heart-shaped sculpture in San Francisco, with a 2014 USPS limited-edition Love Stamp and a first-day-of-issue digital color postmark. The sketch was made out of a photo I took on June 24, 2012. The Cut Paper Heart Forever Stamp, according to a USPS news release, "depicts a large white heart enclosing a smaller pink heart with a saw-toothed edge along its left-hand side. Surrounding the central hearts are pink swirls with smaller hearts imbedded in the design, and a ragged-edge motif that echoes the edging on the small pink heart. The hearts and swirls are contained within a red square that has "pinked" edges, as if cut with pinking shears. A white border frames the entire design." Only select stamp issues offer a digital color postmark. To order a digital color postmark, customers will have to use envelopes or postcards made of “laser safe” paper, with no glue on the flap of envelops and no coating on the postcards. The maximum size of all digital color postmarks is 2" high x 4" long. Allow sufficient space on the envelope to accommodate the postmark. Do not use self-adhesive labels for addresses on the envelope or postcard. Two extra items must be included for testing. A minimum of 10 envelopes or postcards at 50 cents per digital color postmark is required, paid by a check, money order, or credit card. USPS may reject hand-painted and other cachet envelopes that are not compatible with their digital color postmark equipment, and substitute traditional black rubber postmarks if use of non-specified envelopes or postcards results in poor image quality or damage to equipment. The rest of procedure is similar to requesting traditional black rubber postmarks: "customers should affix the stamps to the envelopes and address them to themselves or others for return through the mail. Or, they may include an additional self-addressed return envelope, large enough to accommodate their canceled items, with sufficient postage affixed for return of their postmarked items. Mail the request for a first-day-of-issue digital color postmark to the corresponding city of issuance. Post Offices will then forward all customer requests for digital color postmarks to Cancellation Services, Stamp Fulfillment Services, PO Box 449992, Kansas City, MO 64144-9992. After applying the first-day-of-issue postmark, the Postal Service will return the envelopes to the customer by U.S. Mail."